His daughter Erica, Class of 2012, unwittingly echoes her father as she describes her college search. “I didn’t want to go down one direct path yet,” she says. 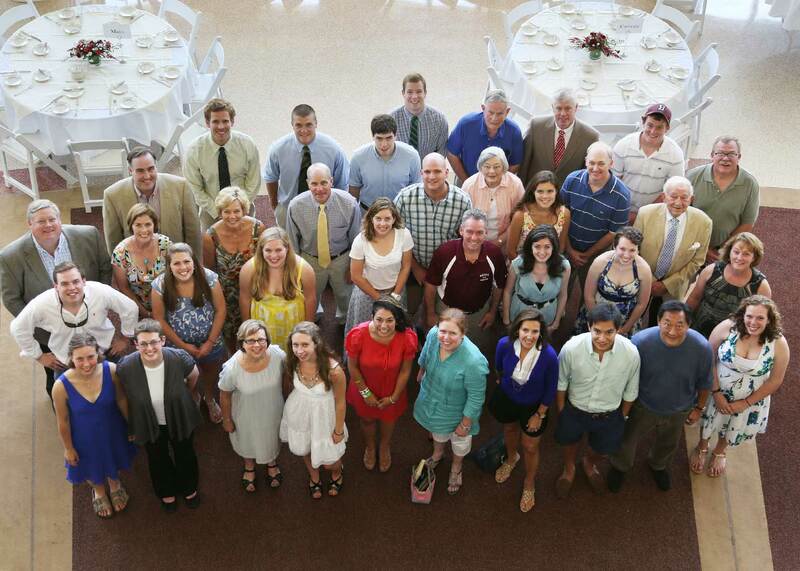 The college’s alumni database counts 12 members of the Class of 2012 who have a Bates alumni parent. That number rapidly grows when alumni grandparents, siblings and other Bates relatives are included, as evidenced by the big turnout in Perry Atrium for a photograph on the day before Commencement 2012. Related story: Bates debuts the Alumni Admission Legacy Program, June 10-11. 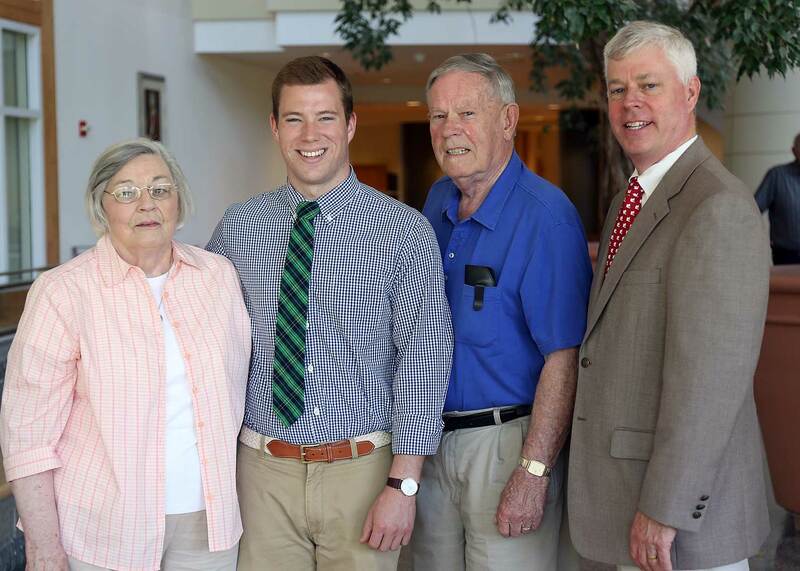 For example, grad Richard Sullivan III ’12 was joined by grandparents Edith Lysaght Sullivan ’56 and Richard Sullivan Sr. ’57, as well as his father Richard Sullivan Jr. ’81. The four Sullivans are among 17 family members to attend Bates. And Devon Bonney’s Bates family includes siblings Erin ’09 and Garrett ’15, grandfather Wes ’50, aunt Melissa Bonney Kane ’81, and parents Mike ’80 and Alison Grott Bonney ’80. With some prodding, Erica Long acknowledges other commonalities between her parents’ experiences and hers. For example, she and her father are both English majors, and both worked at WRBC, the college radio station. In 2010, Robert spoke at the Parents & Family Weekend interfaith service, while Erica has been active in the Multifaith Chaplaincy and addressed her peers at Baccalaureate during Commencement weekend. Erica and her mother, Betsy Pohl ’80, share their respective stories of Hedge Hall, making a poignant connection across 30 years of Bates history. However, Erica insists that her parents never pushed her to apply to Bates. Richard Sullivan III '12 is joined by grandparents Edith Lysaght Sullivan '56 and Richard Sullivan Sr. '57 and father Richard Sullivan Jr. '81. They represent four of 17 family members to attend Bates. Likewise, Kristy Andrews ’12 acknowledges that while her family history was influential — she and her brother, Mark Andrews ’09, are fourth-generation Batesies — it was never the deciding factor. While parents and children both cite Bates’ smallness, its academic rigor and the enduring value of the liberal arts education among the school’s attractions, some things do look different today. The college has undergone considerable physical changes while the classroom experience continues to evolve thanks to emerging technologies that make knowledge more immediately accessible and shareable. All parents agree that the food is vastly better now, too. “It just has a good, welcoming, regular-folks feel to it that I didn’t get at any other place,” says Robert. He borrows Erica’s term “Bates vibe” to describe the openness and accessibility that persists today. That vibe has an even stronger resonance now. Robert recalls a college friend who came out after graduation. As was true in most of U.S. society at the time, “the environment at Bates at the time made it unthinkable for him to reveal his true self” as a student, he says. Both Erica and Kristy agree that Bates was the best choice for them, and their experience has been filled with its share of opportunities and surprises. For Erica, the fact that her parents are alumni didn’t shape her understanding of Bates so much as Bates shaped her understanding of her parents. “Now I have this thing in common with my parents where at this same age in our lives we lived in this same place,” she says. 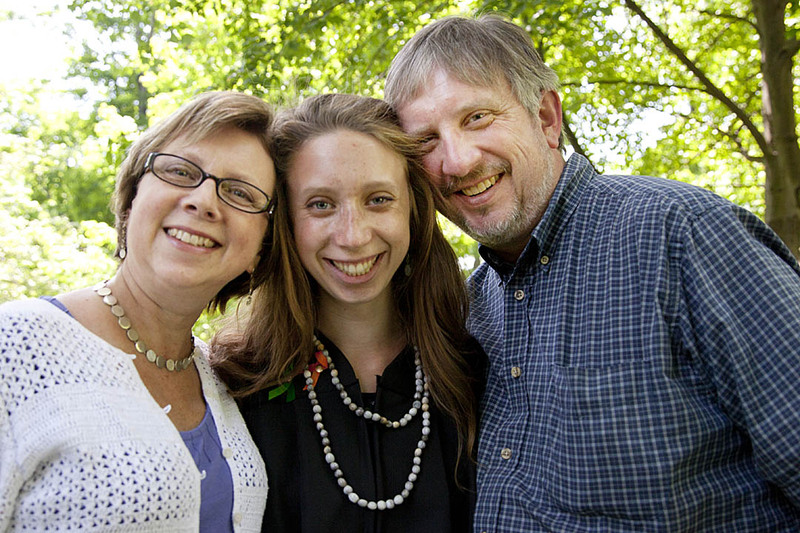 Crossing the stage at Commencement, she joined her parents in yet another role: Bates graduate. “It’s just stunning to me,” Betsy says. “I feel like I just took her there for her first day, and that four years just went by so amazingly fast. Front, from left: Sara Vigne '12, Alison Cornforth '12, Elizabeth Pohl '80, Erica Long '12, Caitlyn DeFiore '12, Donna Avery '82, Elizabeth Kalperis Chu '80, CJ Chu '12, Michael Chu '80, Devon Bonney '12; second row: Palo Peirce IV '12, Meaghan Doyle '12, Kristy Andrews '12, Madeleine West '04, Jeffrey Roy '83, Alicia Roy '12, Erin Bonney '09, Alison Grott Bonney '80; third row, Palo Peirce III '82, Julie Gleason Doyle '86, Cindy Holmes Andrews '74, W. Jeffrey Helm '76, Steven Imig '02, Edith Lysaght Sullivan '56, Sarah Cleary '12, John Cleary '80, Wes Bonney '50, Mike Bonney '80; fourth row: Andy Doyle '86, Mark Andrews '09, Kevin Helm '12, Elliott West '12, Richard Sullivan III '12, Richard Sullivan Sr. '57, Richard Sulllivan Jr. '81, Garret Bonney '15.